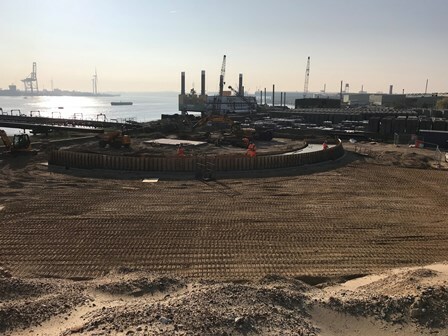 A new £3.5 million dry discharge system at CEMEX Northfleet Wharf is set to secure Thames river traffic and improve building materials throughputs at the site. The Port of London Authority (PLA) is investing in the new conveyor and infrastructure as part of their Investment Plan. The development will enable CEMEX Marine dredgers to discharge sand and gravel more efficiently for processing at the Northfleet site. CEMEX Marine dredgers bring sand and gravel from the North Sea and other off-shore locations into three wharves along the Thames including Northfleet, primarily for use in the London construction market. The site currently handles approximately 500,000 tonnes of material a year, which will increase to approximately 800,000 – 850,000 tonnes with the system due to the faster turn round of vessels. The PLA’s Investment Plan is principally aimed at delivering the goals of the Thames Vision, which targets greater river use, alongside an improving environment. The Plan’s goals are to sustain or increase port trade/river use and generate commercial returns. CEMEX’s Marine Director, Kurt Cowdrey comments “We welcome the opportunity to partner with the PLA to improve cargo handling on the Thames. London is an important market for us and this investment will provide a platform for continued use and future growth at Northfleet.